The Washington Redskins did the right thing when they sat RGIII against Cleveland, the week after the Baltimore game in which he injured his right knee. They did the right thing in the weeks that followed by altering their offensive game plan to fit RGIII’s new and temporary limitations. Now Coach Mike Shanahan is getting buried in criticism for not having pulled the kid in Sunday’s playoff loss to Seattle despite being obviously injured. I think some understanding of both men is in order. What if the kid had been able to rally the Skins to a game-tying touchdown? Would the critics still be piling on Shanahan? Doubtful- which says to me a lot of this outrage is less about RGIII and more about a decision that may have cost the Redskins the game. And the outrage comes chock-full of hindsight. Who knew a bad snap from center would cause Griffin to awkwardly hyperextend the knee again on the god-forsaken mud hole that passes for turf at FedEx Field? From a competitive standpoint, I think most will agree RGIII should have been pulled in the 2nd half after a 9-yard run out of bounds in which he basically dragged his right leg along like it was hanging by a thread. That looked alarming. But Shanahan is nothing if not loyal. The most compelling argument RGIII made at half-time to convince the coach he should keep playing was his insistence that he had earned the right to stay in there and give it his best shot. To me that’s indisputable. The kid, through most of 15 games did everything humanly possible to earn the right to stay in there. But was it misplaced loyalty? Does the Head Coach have an obligation to overrule a competitive player who will always say he’s healthy enough to play whether he is or not? Yes and Shanahan admits it. He says he trusted his gut on this but that his gut isn’t always right and that he would, indeed, second-guess himself over the decision. Even RGIII admits he endangered himself when he continued playing after having tweaked the knee just before his 2nd TD pass in the 1st quarter. But this was the playoffs. You think RGIII was the only player out there playing hurt? When Kirk Gibson came in to pinch-hit for the Los Angeles Dodgers in the bottom of the 9th inning of a World Series game when Gibson could barely stand, much less walk, did people think that was abusing the athlete? Of course not. Because he hit a homerun that won the game. 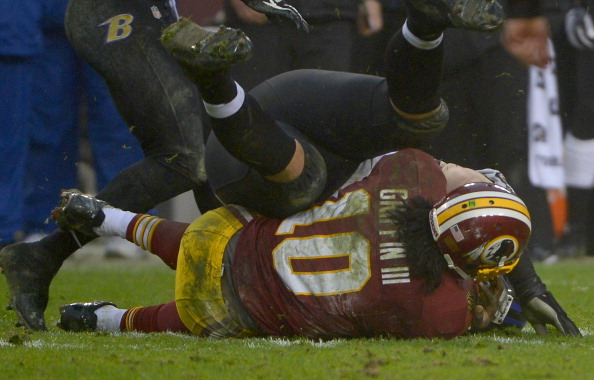 It turns out RGIII is not indestructible but is, in fact, all too human. Both in his stubbornness and his physical health. Mike Shanahan is human too. I would argue, if anything, he put his loyalty to his QB above the strategic dynamics needed to win that game. And in retrospect- yes- he made the wrong decision. But I don’t think he deserves to be vilified or fired for it. Everyone will learn from this and especially RGIII and Mike Shanahan, There is a point where steely determination and sheer grit begin to provide diminishing returns. RGIII will learn to be a little less reckless. Coach Shanahan now knows there will be times where he’ll have to stop RG from being his own worst enemy. What I can’t stop thinking about, is the cruelty of fate and the vulnerability of even the most talented and ferocious of athletes. I will never forget the Skins game against the Minnesota Vikings this year when Griffin scored on a 78 yard touchdown run. His Olympic-class speed was breathtaking to behold. It was the longest scoring run by an NFL quarterback in 16 years. Griffin piled up 138 yards rushing that day. And then I picture the botched snap from center on Sunday when the same gifted athlete could not bend down and pick up a dropped football without collapsing in a heap on the muddy turf. Because of his work ethic and desire, however bad this knee injury turns out to be- it will be overcome. He may never be able to run again like we saw with astonishment this season- but he will be back and 80% of Robert Griffin III is way better than 100% of most others. But painful lesson, indeed, for both he and his coach. None of it should take away from the amazing, ridiculously unexpected result of this Redskins season when a 22-year-old man/child led a 3-6 team to a divisional title through guts, leadership, and, yes, ironically, the kind of unflinching toughness that ultimately cost them in the end. Back in 1979 when the Dallas Cowboys annoyingly anointed themselves “America’s Team”- at least they were good. They won Super Bowls in 1972 and 1978 and made appearances in title games in 1971, 1976, and 1979. Then they almost made it four Super Bowls in a row in the 1990’s, winning it all in 1993, 1994 and 1996. Since then, however, it’s been 16 years without a Super Bowl appearance. In fact, they only have one playoff win at all in those last 16 years. They may call themselves “America’s Team,” but no one else in America does. A non-scientific ESPN internet poll proves it emphatically. At last check, 73% of Americans (or at least 200,000 people with an internet connection whom we presume to be mostly Americans), are rooting for the Washington Redskins this Sunday night when they host the former “America’s Team “ in a battle for the NFC East title. Winner goes to the playoffs, loser goes to the showers and then to a golf course in a moderate climate somewhere. State-by-state, the ESPN poll shows 49 of them are rooting for the Redskins and one is backing the Cowboys. And Texas is not really a state- it’s a Republic plus they’ve engaged in a lot of secessionist talk over recent years. Powered by three engaging rookies, quarterback, RGIII, running back, Alfred Morris and Kicker, Kai Forbath, these Washington Redskins are a quite loveable group and surprising, to boot. CBS Sports.com prognosticator, Pete Prisco, predicted they’d finish the year 3-13. Looked good there for ol’ Prisco when the Skins went into their bye week with a 3-6 record. But something magical happened in that off week. Coming off a humiliating home loss to the Carolina Panthers and with head coach, Mike Shanahan publicly stating the players were now playing for next year- RGIII would have none of it. He reportedly gave a Knut Rockne-type speech that would have made Rockne himself proud. It was so inspiring, in fact, that his teammates immediately voted to make Robert one of their captains. Now here it is six straight victories later. The Skins have even been victorious in one game without RGIII (thank you Kirk Cousins and Mike Shanahan). Last week, they proved they could win with RGIII’s arm and without his legs. The previously porous defense now comes up big whenever it seems absolutely necessary. The most humble kid in the universe who has a 20 year-old car and still sleeps on is parent’s couch when he’s visiting his old home is named Alfred Morris and the young rookie is just 104 yards away from setting the all-time Redskins single season record for rushing. And Kai Forbath, a former UCLA kicker, who could not hook up with another NFL team gets picked up in the middle of the season and responds by going to the Hall of Fame. Or at least the ball did- the one that marked his 17th consecutive field goal without a miss- the best career start for any kicker in NFL history. So what’s not to love about the new America’s Team? 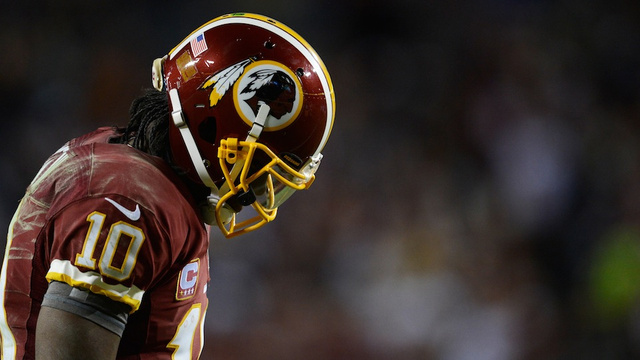 Even if they lose, these Skins have given their fans more than anyone could have hoped. But I don’t think they’ll lose. This feels, for all the world, like a Redskins-Cowboys matchup at old RFK stadium 40 years ago- a game the Redskins won 26-3 before going off to face the undefeated Miami Dolphins in Super Bowl VII (back when you could still tell what the Roman numerals stood for). That game was for the NFC championship- but this one- after a mostly sorrowful 20 years in the wilderness for Redskins fans- seems every bit as big. Americans- we thank you for your support. He is entirely too special to risk suffering any long-term damage. Even short-term thinking- one week’s rest, at a minimum, is the least the Redskins should do for their once-in-a-lifetime quarterback. And it’s a decision the Redskins may need to take out of the kid’s hands because based on what we saw last Sunday at FedEx Field, Robert Griffin is a selfless warrior who would claw and scratch to get back out on the field, no matter how many of his limbs are hanging by a thread. It’s not just about his health and the “mild” sprain of a right knee. Imagine winning a key playoff-atmosphere game led by your other rookie quarterback. Oh, that’s right- that’s precisely what Kirk Cousins already pulled off last Sunday against Baltimore. But can he lead the team for an entire game and claim a win over the suddenly resurgent Cleveland Browns? I think so. First of all, the Browns haven’t exactly been beating the elite squads of the NFL. They beat a 7-6 Pittsburgh team without their starting quarterback. Then they edged the 3-10 Oakland Raiders and last week, the 2-11 Kansas City Chiefs. The Browns won’t be a cakewalk, but any victory by the Skins without RGIII would do the team enormous psychological good. The kid’s will to win has already become contagious. Let’s prove the theory this Sunday in Cleveland without him. For the short-term, a one-dimensional, pocket-passing, less mobile RGIII may very well win over the Browns- but it’s the two games that follow and potentially the playoffs after that where the Redskins will need his arm and his legs. And considering the intensity with which he plays and that this may not be the last time he sits out a game or two, it cannot hurt to give your back-up QB practice and game time. And for the long-term, it would end up as the most tragic story in all of sports, if Robert Griffin were to have a career-threatening injury. It is hard to justify risking all that promise for the temptations of the present. Granted, this doesn’t really compare to what the Washington Nationals decided to do with their young pitching ace, Stephen Strasburg last year. Strasburg was not even hurt. That was a much gutsier decision. But there is a similarity in the basic question of whether the future is worth considering, protecting and nurturing. Baseball is much more of an annual marathon with its 162 games over six grueling months. The very nature of the sport and its lengthy seasonal slog lends itself more to long-term thinking. The NFL is the polar opposite. It is a sport premised on the future-is-now philosophy of immediate gratification. They only play 16 games. Each contest is 6% of the regular season. It’s a do-or-die each week. This decision will be quite the test. Go for the brass ring now? Or rest the kid, let him heal a bit and put yourself in a position to reach for a half dozen brass rings over the next ten years- and maybe even one later this year? For this season and for the many more ahead; for the two divisional games that follow in Philadelphia and home against the Cowboys- this is a no-brainer. For this week- let RGIII lead the team from the bench. The Redskins remind me of a 3-year old with a shiny new toy who plays with it so obsessively, the thing is broken and doesn’t work anymore after a few weeks. It could be worst, though. If they could figure out how to do it, RGIII would also catch passes, block and play in the secondary. Unfortunately for the kid, he ended up with the Washington Redskins; a team that is proof that no matter what apparent good fortune has landed in their laps, crap still travels downhill, directly from owner, Daniel Snyder and the Father-Son Shanahan coaching duo. The Rebuilding Century continues. Except, of course, these are the Redskins. They have nothing to rebuild with til the year after next with no 1st round draft picks next season (traded for RGIII). They will continue to be in the 2nd year of an $18 million reduction in their salary cap for violating the NFL’s rules on signing free agents during the lock-out last year. Last week, receiver, Josh Morgan, drew a personal foul to end the Skins chances at a comeback in St. Louis. And this past Sunday…a late personal foul cost them again…this one apparently incurred by Redskins offensive coordinator, Kyle Shanahan. Unlike Morgan who at least faced the music after the game and talked to reporters, the Redskins did not make Kyle Shanahan available to the press after the contest. Here’s the message this sends to the team. The players are accountable. The coaching staff is not. Starting at his own 2-yard line, RGIII had driven the Skins to the Bengals 19 yard line with enough time left for several shots at the end zone. They ended up losing 36 yards. How do you accomplish such a thing? Here’s how: a 15-yard sack, a 5-yard off-sides penalty and young Kyle’s personal foul. On their last play of the game, RG faced a 3rd and 45. Contemplate that for a moment. 3rd and 45. There is no doubt the Redskins picked up a franchise player in RGIII. If he physically survives the beatings he will be taking week after week, he will have been worth every one of those #1 draft picks. The Skins are now averaging over 30 points on offense every game. At quarterback- mission accomplished. I do find it striking how differently the Redskins treat their star player than, say, how the Washington Nationals protect Stephen Strasburg. The Nationals are guarding their investment by ending his season early, convinced their long-range planning will yield a bounty of future stellar seasons from Strasburg. The Redskins? With the Shanahan family clinging to dear life for their jobs if they have another abysmal season- Sunday showed how much they care about RGIII. They will keep running him out there until he ends up in the ER. And that, ladies and gentlemen, is the difference between long range and short range planning, between Ted Lerner and Daniel Snyder- between class and crass. It was the football version of Stephen Strasburg striking out 14 in his major league debut. Of watching a 19 year-old eclipse just about all records for any teenager in baseball history. Those who wondered if the Washington Redskins had lost their marbles by trading away three 1st round draft picks for Robert Griffin III are wondering no more. While several other rookie quarterbacks looked very much like rookies in the first Sunday of football action this season (including #1 pick, Andrew Luck, who threw three interceptions and fumbled once), RGIII left a dizzying legacy after just his first game. He completed his first 8 passes in a row, including an 88-yard touchdown. He finished the first half with a perfect passer rating- a feat never before accomplished by any first-year player in the history of the NFL. He is one of only four rookies to debut with more than 300 yards passing. And his team won in a huge upset. He accomplished this on foreign turf, against a New Orleans Saints team that didn’t lose a single regular-season home game last year. RGIII managed to outplay Drew Brees, who set an all-time NFL record for passing yards in 2011. Beyond the stats, RGIII was cool, calm and collected- displaying a maturity way beyond his 22 years. This kid is the real deal. And he makes those around him play better. History is replete with Heisman Trophy winners who are total busts in the NFL. Traditionally, it takes a young quarterback about three years to get into the groove of things. And again, history shows the teams they play for take awhile to get in gear too. But this Washington team may be different. For one thing, in Mike Shanahan they have a coach who is famous for his work with quarterbacks. He certainly did pretty well with one John Elway. His son Kyle, who when he had some talent to work with in Houston, became one of the top offensive coordinators in the league. The father-son duo are known for their x’s and o’s offensive savvy. They just haven’t had any talent to work with in Washington over their first couple of years. But boy, do they now. And they are smart enough to build their offense around RGIII’s considerable skills. Watching what the Kid can do with his canon arm, his speed and agility and his smarts and composure- the Shanihan’s may be in for a whole lot of redemption in the years ahead after two disappointing seasons in Washington. The Redskins are also now in their 3rd year of their 3-4 defense and finally have the personnel to pull it off. They way they handled the Saint’s high-powered offense and future hall-of-fame quarterback was truly impressive. The team’s success is not all about RGIII. But no matter what side of the ball you play on, it is impossible not to feel good about yourself and your team, when you know you have a guy like that calling the signals and leading your club. Three 1st round draft picks for Robert Griffin III? A friggin’ bargain. Stephen Strasburg and Bryce Harper for the Nationals. And RGIII for the Skins. Can we handle all this lightening in a bottle here in the nation’s capital?